Quantile classification divides classes so that the total number of features in each class are approximately the same. This type of classification is useful for showing rankings and ordinal data. However, quantile classification can be deceiving because it doesn’t show how much difference is between each rank. If you were to create more classes, this problem would be improved but not completely resolve it. How is Quantile Classification Used in GIS? If you want to show the ranking of area for each state in America, you can use the quantile classification. If you generate 5 classes, this means that 10 states will reside in each class. The first class will have the 10 largest states in terms of land mass. The last class will have the 10 smallest states. 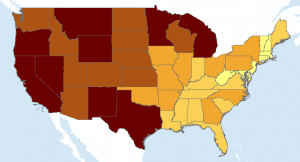 It’s easy to see states like Texas, California and Montana are in the top 10 for land mass. The east coast states are definitely the smallest. This makes sense but let’s validate this map classification. We can start looking at area in the attribute table. The column chart below sorts area size from largest to smallest. Breaks are inserted every 10 states. We can clearly see each grouping of 10 states and how they rank in terms of land mass. Why Use Quantile Classification in GIS? Quantile classification is ideal for ordinal data. When you have clear ordering of the variables, then this is one of the advantages of quantity classification. If you want to rank data into categories such as high, medium and low, this is another opportunity to use quantile classification. In our example we rank state sizes into 5 even classes. Each class consists of 10 states and their areas. 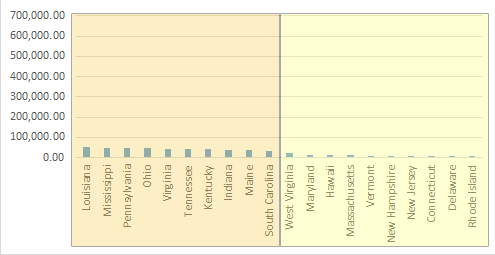 Our choropleth ranks state sizes so that the total number of features in each class are the same. In a Voronoi Diagram, when you take a point in any given Thiessen polygon, it indicates that it’s closer to that generating point than to any other. Equal intervals, quantile, natural breaks, pretty breaks- data classification methods generate different choropleth maps. We explain the types of maps here.